Lock in a great price for Park Hyatt Maldives Hadahaa – rated 9.2 by recent guests! I am impressed by the hospitality and consideration of the staff there. Beaches, Food , Villas, Facilities, all. aspects of this hotel are of a very high standard really enjoyed the Bar and all the events and activities on offer. The best Hotel I ever stay in Maldives as I visited the country over 20 times. Everything is perfect. Staff is really nice and responsive. Spa is highly recommended. We have been upgraded to sunset villa!! Our butler even lent us her personal waterproof camera so i can take pictures of baby shark and turtle! I very much enjoyed everything on the islands. We would really like to come back to this paradise sometime. Many thanks to all the staff who have made our stay really comfortable. Высочайший сервис, высочайшего уровня персонал, большое спасибо Наталье и Рустаму. Шеф Пабло - просто гений, его баранина - шедевральна. Отличный массаж. Ежедневно плавали с черепахами!!! Очень сказочный натуральный домашний риф. Седьмой раз на Мальдивах, были в очень достойных отелях, но такого обилия морских жителей нигде не было! Дополнительный перелет незаметили, везде сопровождали сотрудники отеля! Nádherné místo, vynikající jídlo a vřelý personál. Maximální spokojenost! Park Hyatt Maldives Hadahaa This rating is a reflection of how the property compares to the industry standard when it comes to price, facilities and services available. It's based on a self-evaluation by the property. Use this rating to help choose your stay! Enjoy luxurious stays on an exclusive island at Park Hyatt Maldives, with 5-star villas located steps from powdery white sand. It features an outdoor pool, PADI 5 Star dove and activity center, first-rate spa and fitness center. Nestled amid tropical greenery, villas feature open-concept bath areas that offer scenic views. Villa comforts include private decks with day beds, media hub and flat-screen TV. Lazy afternoons await by the large freshwater pool or in the relaxing environment of Maldives Park Hyatt’s spa. Offering personalized service, a leisure concierge can help arrange day trips. 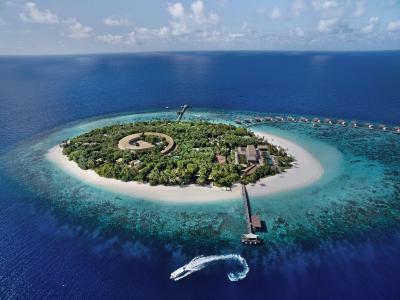 Park Hyatt Maldives is about 249 mi to the south of Velana International Airport. 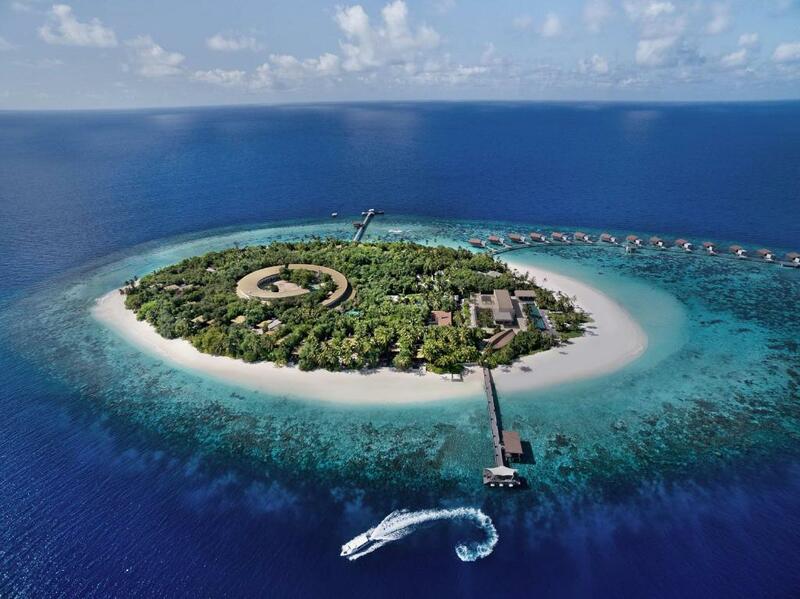 When would you like to stay at Park Hyatt Maldives Hadahaa? 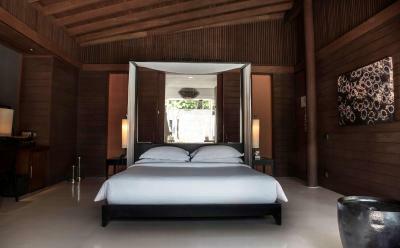 The 165 sq m villas features a king bed with chaise lounge, private deck with table and chairs, sunbeds, indoor and outdoor rain shower area with terrazzo bathtub and direct access to the beach. 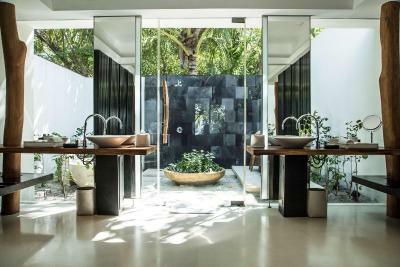 The 180 sq m villas are fitted with a king bed, chaise lounge overlooking a private plunge pool and deck, indoor and outdoor rain shower area with terrazzo bathtub and direct access to the beach. 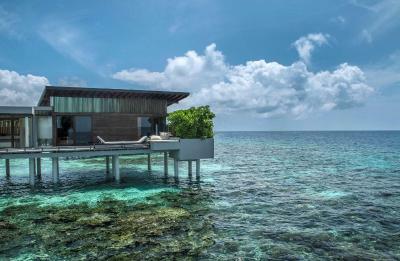 The water villas with ocean vistas feature a king bed, indoor bathtub, private deck with plunge pool, semi-submerged sun beds, outdoor bale and individual access to the reef. The 115 sq m water villas with 180° views of the ocean, features a king bed, indoor bathtub, sun deck with daybed and direct access to the house reef. The 300 sq m villa fitted with a king size bed and a private outdoor terrazzo bathtub and rain shower area. Also includes a second bedroom at 44 sq m, fitted with two single beds and a separate bathroom. The villa features large pool with semi-submerged sun beds, outdoor bale/cabana. The 265 sq m villa featuring a large pool with semi-submerged sun beds, outdoor bale/cabana, a king size bed and a private outdoor terrazzo bathtub and rain shower area. House Rules Park Hyatt Maldives Hadahaa takes special requests – add in the next step! Park Hyatt Maldives Hadahaa accepts these cards and reserves the right to temporarily hold an amount prior to arrival. Domestic Flight transfer takes 55-105 minutes from Velana International Airport to Kooddoo Domestic Airport. From there, speedboat transfer takes 30 minutes from Kooddoo Airport to the property. More than 2 years old and below 12 years are considered children and get 50% discount on additional meal plan. In the event where the guest name does not match the name on the credit card, the total reservations will be charged with the guest checking in and any fees charged to credit card used to guarantee the booking will be refunded back. The internet barely works. A couple of hours each day it doesn't work at all. Obviously, people don't go the island for browsing the nets, but I wanted to work a little. Even if you buy a full board, you still have to pay for drinks (even water). It's not too expensive ($7 for coke or a bottle of fresh water, it's not too much, but still unexpected). The place feels like a financial minefield. E. g. they offered us to have dinner at the beach instead of the cafeteria and charged $200 for the same food we could eat for free. In the end, we have spent only $500 extra, but I guess most guests spend more. Once we ordered a dessert after dinner and asked if we could eat it in the room, and some employee said that we have to eat it in the cafeteria. Likely because they charge extra $30 for a dinner in the room, but it is still mean. I once jumped into the water from the pier (it was high tide and the water was deep and clean), and immediately an employee came and told me that it's prohibited because it's dangerous. For god sake, they have an employee constantly watching the pier, why can't that employee check that people jump where and when it's safe instead of prohibiting. This island has just 50 villas (although the island is relatively small), which is much less than other resorts on the Maldives. The implication is that each villa has direct ocean access (and almost all villas except nearly 5 have a beach), and the beach is not overcrowded (in fact, we have seen only a few people on the beach). For just 100 guests they have a lot of sunbeds and gazebos, so there's always a place to lay down. They have two public freshwater pools and most of the time nobody is swimming in them. They have an enormous number of employees on the island: about 200 employees for 100 guests. I'd say they have too many employees. The implication is that they do room cleaning twice a day (WAT?) and there is always available waiter in the restaurant. They even have a doctor on the island (my ear was clogged, and surprisingly they didn't charge me for visit). We had a full board, and the food was very good and a very good choice. The island is far for Male but the transfer is organized perfectly. You can rent snorkelling gear or kayak for free (and transparent kayak for just $25). Generally, the island exceeds expectations: it's much better in real life than on photos. There were some ants in the Gym, could be solved with a little ant powder, they really didn't bother me that much. The location of the island is a bit far away from Male so check with the hotel to pick a suitable landing and departure time to avoid waiting too long for the domestic flight (which is unfortunately our case). Long travel from Male but worth it!